We’re having a hot spell here in New Jersey. It hit 90 today. August-like weather in June: hazy, humid, airless, and oppressive. Always on the verge of a noisy, refreshing thunderstorm, but none comes. 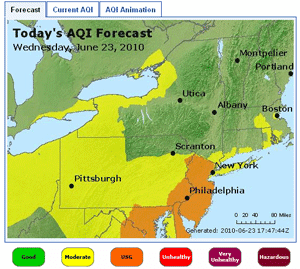 This was the third or fourth day in a row that the National Weather Service issued an air quality alert for the region because of high ozone levels. Besides making things dicey for babies, asthmatics, and the elderly, this kind of air pollution can mess with one’s sense of smell. The evidence comes from a paper published last fall in Chemical Senses. It compared smell ability in residents of Mexico City—a place with notoriously bad air pollution—with residents of Tlaxcala, a geographically similar town with cleaner air. The study is actually an improved version of one done in 2006 by some of the same investigators. The new study used more precise test methods and also looked at trigeminal perception (the in-the-nose sensation of irritancy one gets from inhaling pepper or champagne bubbles). Mexico City air pollution adversely affects olfactory function and intranasal trigeminal sensitivity. Specifically, people in Mexico City have higher olfactory detection thresholds, i.e., they need higher concentrations of odor before they can pick up a scent. They are also worse at odor discrimination—picking the odd smell from a same-same-different trio. To top it off, Mexico City residents are less sensitive to trigeminal stimulation—locating eucalyptol vapor to one nostril or the other. Only in odor identification was there no different between towns. What’s a little alarming is that the test subjects were young: between 18 and 35 years old. This means whatever the air pollution is doingm directly or indirectly, happens quite quickly. The good news for those of us in the United States is that air pollution has been steadily declining for decades, despite increases in population, cars, and miles driven. Still, I would like a nice, loud, air-cleansing thunderstorm right . . . about . . . NOW! Is a lowered sensitivity to trigeminal stimulation a permanent condition, or can one regain sensitivity by moving to another, cleaner locale? I hate to think of a bunch of 18-35 year olds with permanently challenged olfactory sensitivities. Is it kind of like permanent hearing damage after listening to headphones at too high a volume for too long? I wondered the same thing as I posted the piece. There was one study claiming that odor identification is decreased as a function of pack-years of smoking; but that it improves as a function of years-since-quitting. So one possibility is that your smell improves if you leave Mexico City unless you've lived there past some point of no return. Sixty-year-olds who finally leave may experience very little improvement. Even if you leave in time to recover, you may have grown into a person who pays less attention to smell.